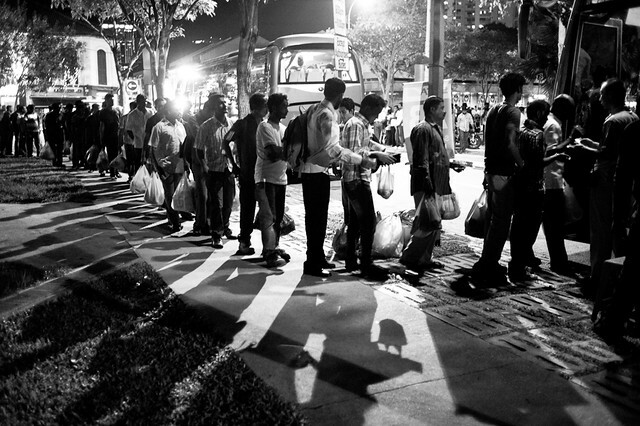 Migrant workers queuing up orderly for their buses to go back to their dormitories. This picture essay was taken before the riot of 8th Dec.
24 Indian nationals were charged in court today for the rampant rioting and subsequent carnage which took place just 2 days ago in an unprecedented show of defiance of authority not seen since the racial riots in Singapore of the 1969. 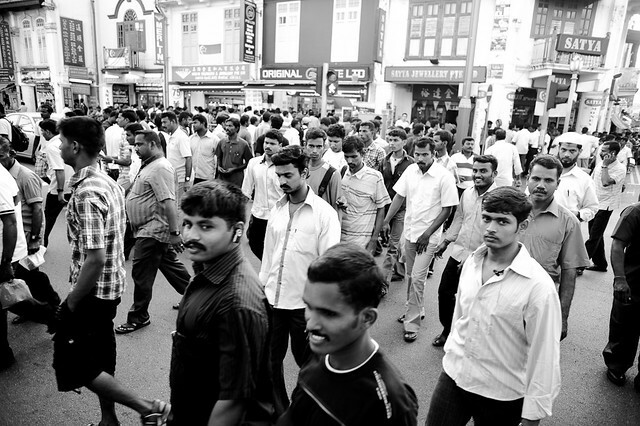 400 rioters took to the streets of Little India, overturning police cars, destroying ambulances and attacking the police, many of them were caught on video running for cover. 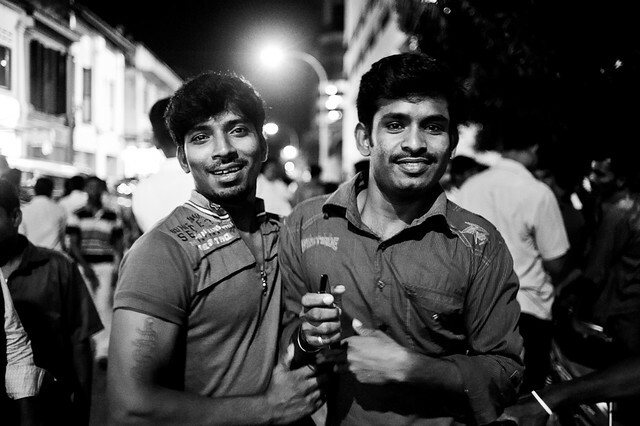 Migrant workers in Little India are actually a peace-loving and friendly lot, and the greatest tragedy that can happen to Singapore as a nation is to disparage them as hooligans because of the riot of 8th Dec. These migrant workers were out enjoying breakfast on a Sunday morning. I sat down among them and photographed them. Try doing that in any other coffeeshop elsewhere in Singapore…. 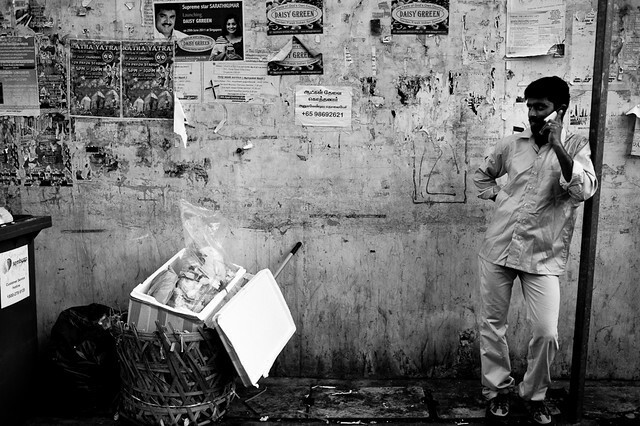 Despite the Little India moniker, you will find people of other races working and living there too. 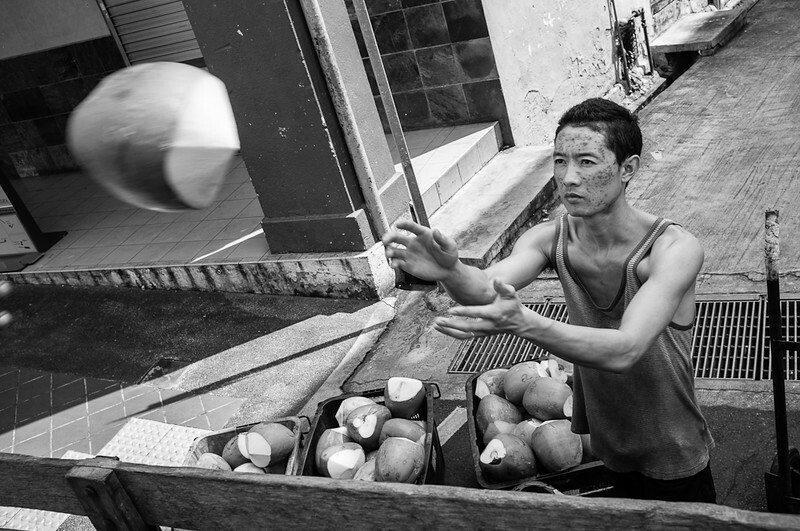 Here, I climbed onto the back of this truck to photograph this guy loading coconuts. According to official reports, a total of 39 officers — 22 from the police, 12 from the Singapore Civil Defence Force and five auxiliary — suffered injuries and lacerations, said the police. In total, 25 emergency vehicles had been damaged, including 16 police cars, of which five had been set ablaze. 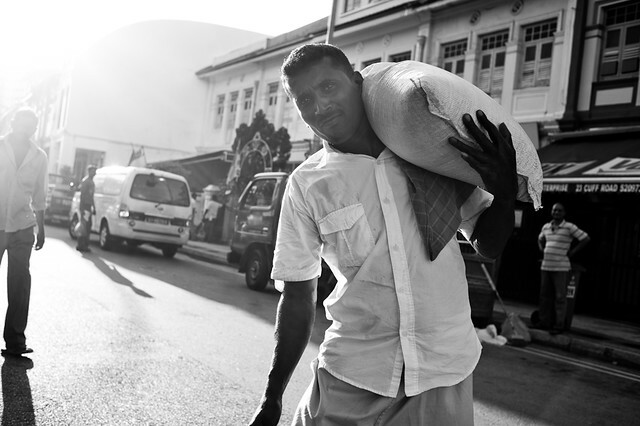 Basking in the light – this migrant worker was waiting at the MRT entrance for his friends to join him at Little India. Normal rules of formal social behavior in Singapore are suspended in Little India – life is more relaxed; you can sit alongside the streets at night without worry. 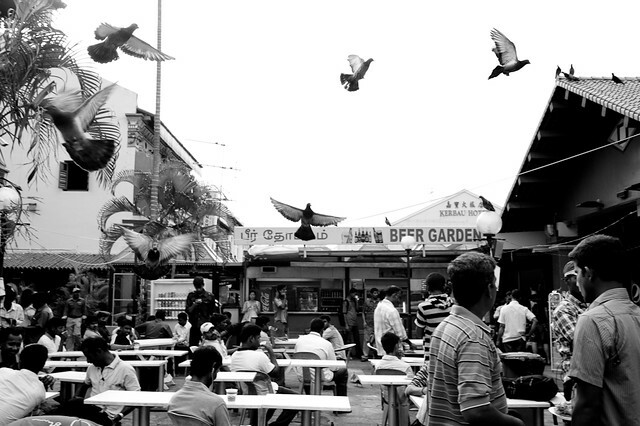 Pigeons soaring over an eating place in Little India. 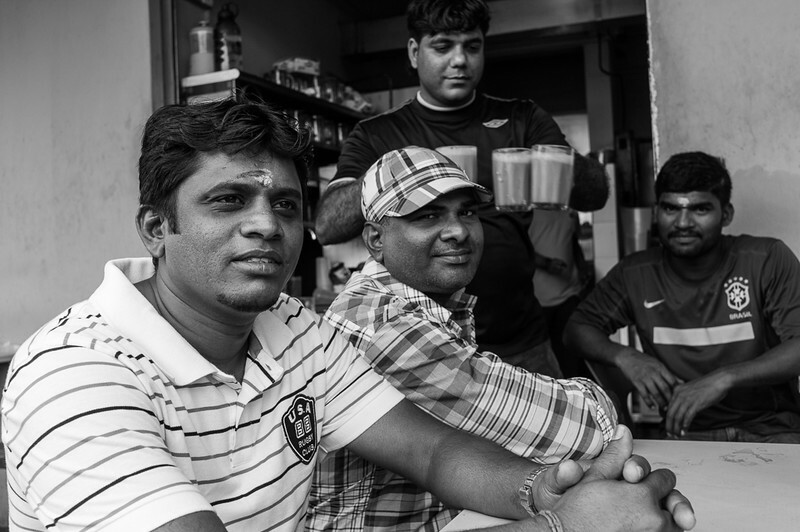 Alcohol might have fueled the riot, but migrant workers are in Little India just for a day of rest – with Sunday being their only rest day for most of them. This flurry of activity has brought great disrepute to Little India, perhaps one of the last bastions of the “old Singapore” – an area with largely unregulated traffic, where foreign workers from “South Asia” (a new term I learnt from the official media) – Indians, Bangladeshis, Nepalese congregate, hang out, and live their lives out on the streets instead of inside air-condition malls like the rest of Singapore. Think your job is tough? Try his! Taken on a Sunday, no less! 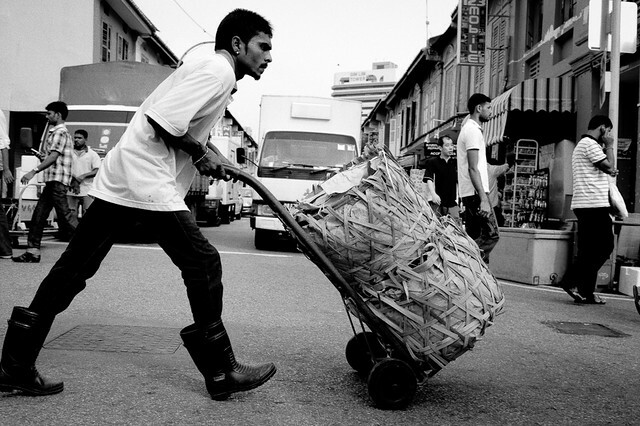 Working on a Sunday – a migrant worker pushes a cartload of goods at Little India. 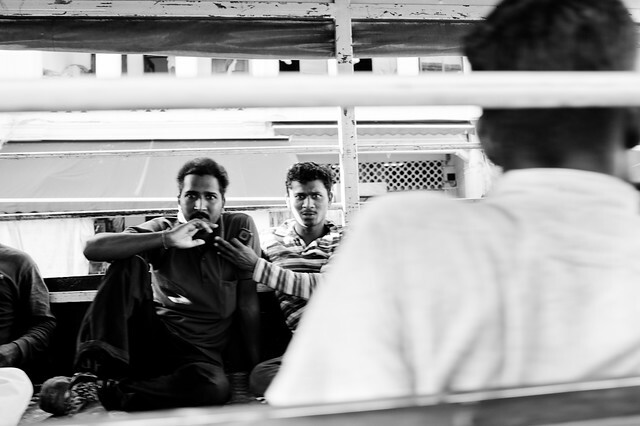 A migrant worker waiting in a truck. Pick-up trucks like these are used to transport workers everyday in Singapore. 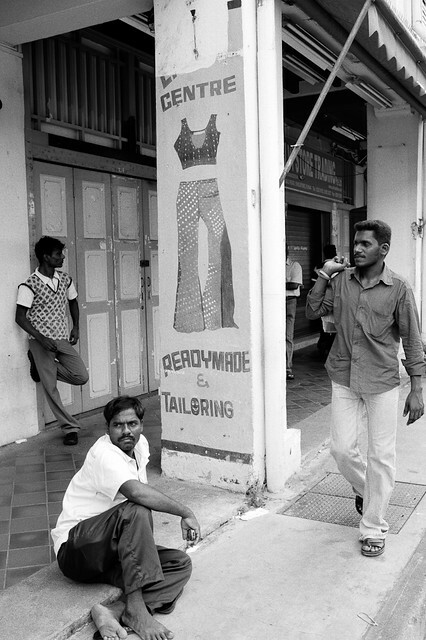 Migrant workers relaxing along the sidewalk at Little India. It will unfortunately, now be viewed as the infamous area where unruly hooligans, fueled by alcohol and driven by an intense inner frustrations borne on the backs of social injustice broke loose and wrecked rampant carnage on life and property. This has already sparked many racist comments and angry debates on the many problems of having too many foreigners in our nation. Some of the friendliest and most spontaneous people I’ve met were from Little India. 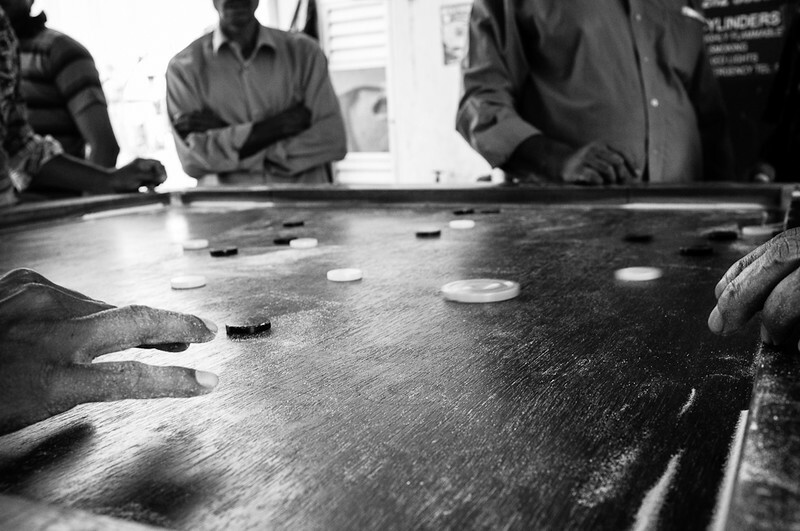 Playing Carrom out on the open streets of Little India. This is definitely not the Little India I remembered. And the rioters are definitely not representative of the people I’ve met and respected and befriended in Little India. Barber cutting the hair of his customer at Little India. Where in Singapore can you walk into a barber shop and take photos of the activity inside? Only in Little India. 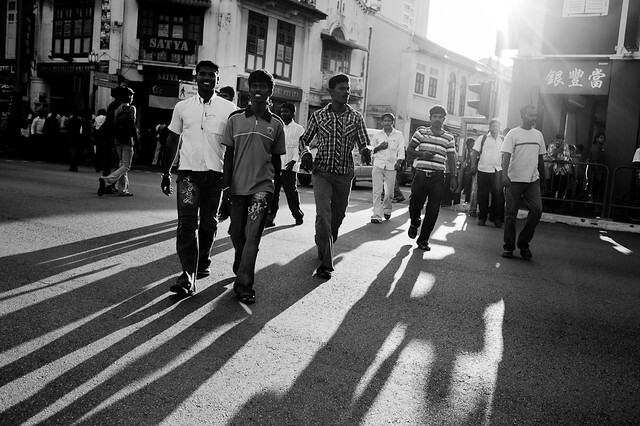 Friendly migrant workers at Little India. Sitting down alongside these Indian nationals, we exchanged small talk about Singapore. This guy was so engrossed with the news, he didn’t even notice me sitting in front of him taking his picture. When he realised, it was a smile that greeted me, rather than one of hostility. I’ve made friends (though regrettably, transient ones as contact had been lost), exchanged smiles, laughter and small talk with the many migrant workers living and working there. 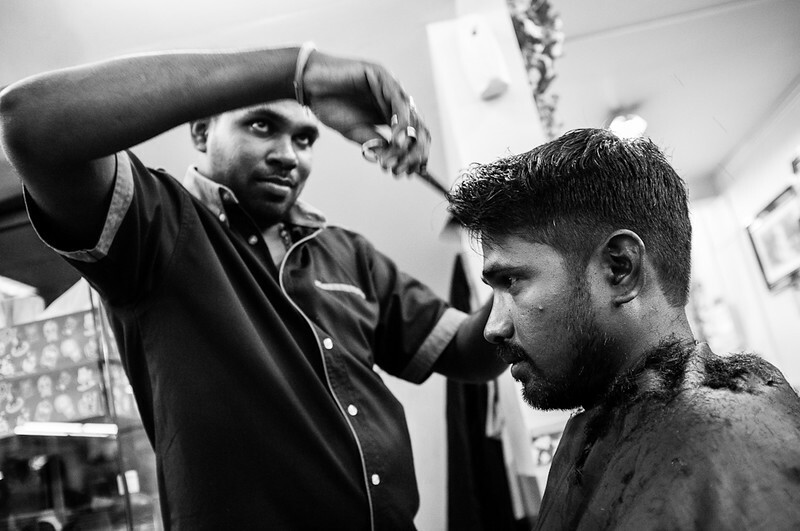 I’ve walked right into a barber shop and took photographs of people having their hair cut; I’ve sat on the sidewalks of Little India chatting with migrant workers from India and Bangladesh, people with the same dreams and visions of a better life like all of us. 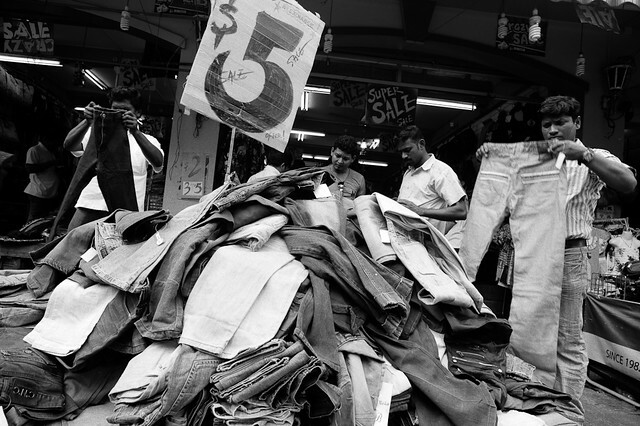 $5 jeans shopping – migrant workers congregating for great deals at Little India. Road crossing in a cavalier fashion – the streets of Little India has its own flavor unlike other roads in Singapore. I’ve been offered food and drinks; I’ve crossed the same roads and small streets of Clive Street, Dunlop Street, Racecourse road, Serangoon road with the same abandonment, cavalier and seeming disregard for personal health and safety; I’ve visited the migrant workers at night while they were waiting for their buses to go home after a day of rest and relaxation out at Little India, for many of them – their only rest day. 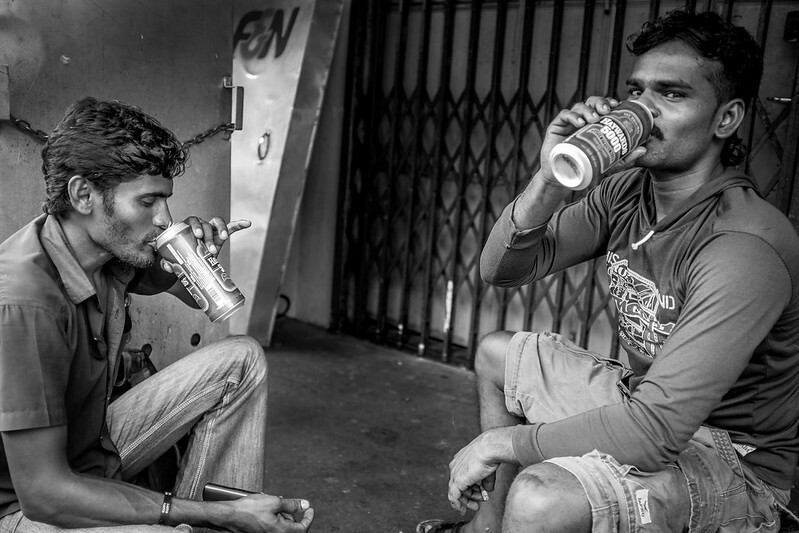 Drinking after lunch – alcohol may have fueled the riot of 8th Dec, but most migrant workers are friendly and harmless, and just want to make a living for their family. 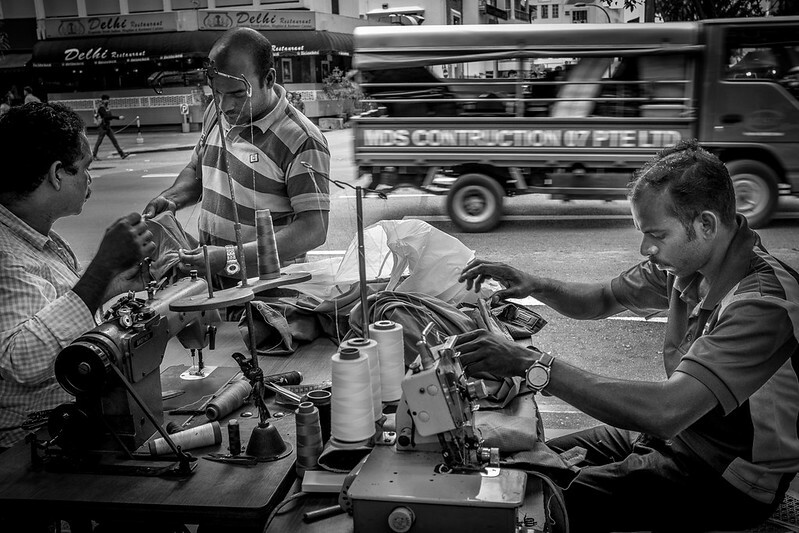 Road side tailors – you don’t see them anywhere in Singapore, but only at Little India! 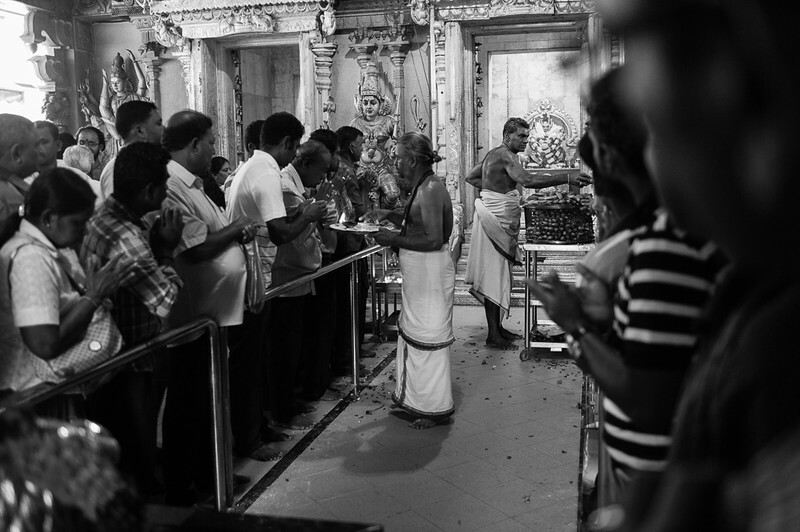 Devotees worshipping inside an Indian temple at Little India. 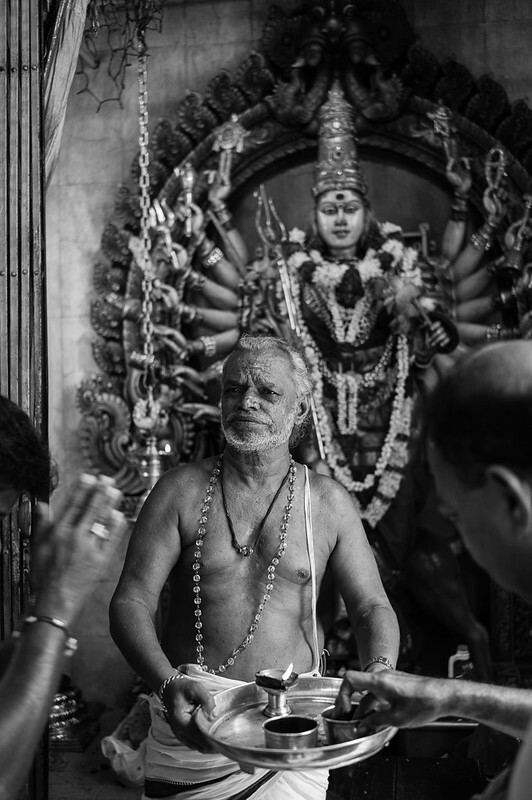 Little India is one of the last bastions of the “old Singapore” – an area not hugely modernised and regulated with the modern trappings of urban society. It’s the most un-Singapore part of Singapore. I hope that doesn’t change because of the riots because it’s a great place I love to visit and hang out, and not feel like I’m trapped in modernity. Taking in the cacophony of sights, sounds and smells in Little India has always lifted me, and suspending the belief that I’m actually in Singapore. 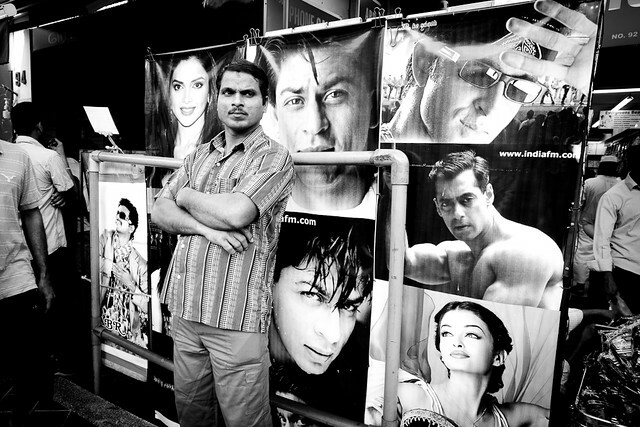 A man in front of many posters – only in Little India. 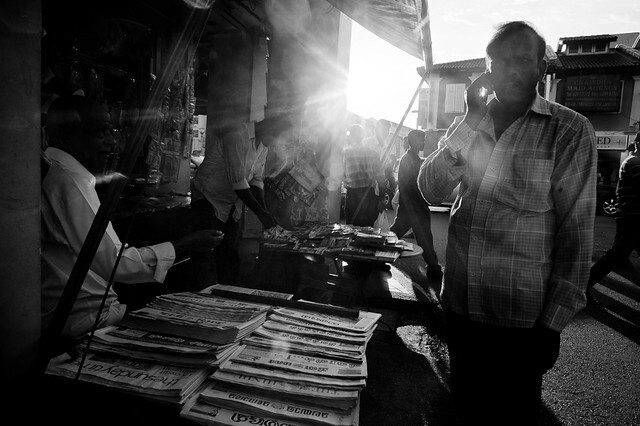 Evening sunlight streaming through Little India on a Sunday. Crossing the road is an art form in Little India. We can all play armchair psychologists and psycho-analyse to death the cause of the riot and the mentality behind the people who could no longer suppress their anger that night; we can try to respond reactively (as our dear Government always does), but one thing is clear to me – Little India the way it is must be preserved. Migrant worker on the phone in Little India. My greatest fear and worry is the institutionalisation of Little India because of the riots. The loss of cultural identity of this area would be the greatest tragedy. 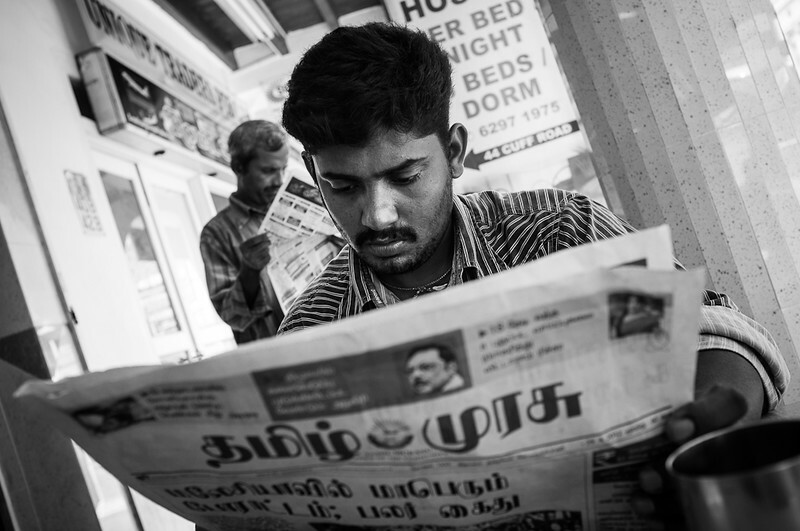 If you enjoyed this post, you may be interested in the other parts of my on-going series on migrant workers in Little India – A Home Away from Home. Click on any of the links below to catch up on the earlier parts. I really enjoyed taking photographs in Little India, and found the people there very friendly and happy to have their photographs taken. I hope this once-off incident started by the 24 (or 400?) does not change things. I would love to go there again whenever I visit Singapore in the future. Thanks for the photos, I liked looking through them.